Removing introduced animals such as mice, rats and cats from these places, which include 20 in the UK’s Overseas Territories, would improve the survival chances of 9.4% of critically endangered and endangered island species. A ranking of the islands in the study finds one of the best sites for an eradication programme is the UK’s Gough Island, part of the Tristan da Cunha Overseas Territory in the South Atlantic. On Gough Island, introduced mice are eating the chicks of ground nesting seabirds, threatening some species with extinction. 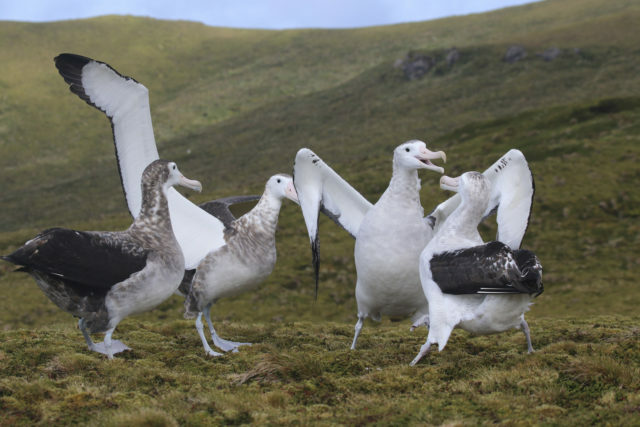 An eradication programme, which is already planned from 2020, could benefit birds including the critically endangered Tristan albatross and the Gough bunting or finch. Islands have many species which are found nowhere else on Earth, and are a hotspot for extinctions, according to the research by experts from around the world including the RSPB and Birdlife International. They have seen three quarters of the known bird, mammal, amphibian and reptile species extinctions since 1500, with species from pigs to rats that have been introduced as a result of human activity often the culprit. Dr Nick Holmes, lead author on the study from Island Conservation, said: “Eradicating invasive mammals from islands is a powerful way to remove a key threat to island species and prevent extinctions and conserve biodiversity. The study published in the journal PLOS One looked at the distribution of 1,184 highly threatened native birds, mammals, reptiles and amphibians and 184 non-native mammals on 1,279 islands worldwide. It drew up a list of 169 islands where eradication schemes could start from 2020 or 2030, based on the extinction risk of native species, the impact of invasive animals and the technical and political feasibility of such a programme. In total, 107 islands were identified where it was both technically and politically feasible to initiate an eradication programme by 2020. Between collecting the data and writing the report, several of these islands carried out successful eradication schemes, including the UK’s South Georgia, where invasive rodents have been wiped out and the South Georgia pipit has made a comeback. Work is also under way to remove introduced rats and feral cats from islands in the Turks and Caicos in the Caribbean to protect the critically endangered Turks and Caicos iguana. And a rat eradication programme would save the endangered Henderson petrel on Henderson Island, part of the UK’s Pitcairn group in the Pacific, the experts said. Jonathan Hall, the RSPB’s head of UK Overseas Territories, said: “This study shows how important it is to remove invasive mammals from islands to prevent further extinctions.